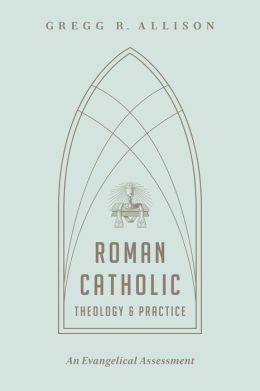 Book Review: “Roman Catholic Theology and Practice: An Evangelical Assessment” by Gregg R. Allison | J.W. Wartick -"Always Have a Reason"
Gregg Allison’s work, Roman Catholic Theology and Practice: An Evangelical Assessment , provides a point-by-point look at the Catechism of the Catholic Church along with commentary and critique throughout from an evangelical perspective. The book thus provides an enormous number of avenues exploration, so we’ll focus on just a few topics here. One issue that some may see rising from Allison’s approach is the notion of “evangelical thought” or perspective. Allison himself notes how difficult it would be to pin down one specific approach. He does, however, do a good job of approaching the various aspects of Roman Catholic theology in a way that allows for different evangelical voices to get a say. For example, in his discussion of the Lord’s Supper/Eucharist/etc., he critiques Roman Catholic teaching from a number of different evangelical positions. That said, Allison is Reformed and focuses much of the space for critique on offering a specifically Reformed criticism. This means that at some points those outside of the Reformed tradition may feel they have differing criticisms to offer that are not fully covered. One can hardly fault Allison for this approach, however, because the space needed simply to cover the Catechism and offer a critique is large. The value of the book for many will be found in the fact that it does present Roman Catholic teaching as found in their official Catechism. Allison does a great job simply presenting what the Catechism teaches in each section before he offers a critique. Allison’s critique often focuses on either the Church-Christ identification or the nature-grace interdependence in Roman Catholic theology. It is the latter which is the most prominent critique offered. Roman Catholicism sees human nature and grace working together whereas evangelicalism sees human nature as corrupted through the fall and not working together with grace. Allison does an excellent job showing numerous difficulties with the Roman Catholic view on this topic and then showing how many doctrines of Roman Catholicism are dependent upon this faulty premise. Allison’s critique of specific doctrines is also helpful. His criticisms of papal and magisterial infallibility are on-point, concise, and decisive. His outline and critique of Mariology, justification, etc. are each valuable and insightful. Again, however, readers may be left hoping there was more space to dedicate to each individual topic. One issue that happens a few times is that Allison seems to inadequately ground his critique. This is particularly the case in a number of places in which the criticism amounts to “evangelicalism dismisses x.” Such a “dismissal” happens frequently through the book on minor topics, but it leaves the reader wondering on what grounds such ideas are dismissed. Often, the only grounds provided is something like not having sufficient biblical warrant or because of its reliance on one of the above mentioned overarching themes (Church/Christ or nature/grace). Another issue is that Allison sometimes offers critiques that do not seem very convincing or are products of his theological presuppositions. For example, his discussion of baptism and his denial that Jesus is speaking of baptism in John 3:5ff seems confused, to say the least. Indeed, he confirms that the discussion of “water and the spirit” are being used in such a way as to refer to the same thing. However, no real alternative to baptism is given of this water- and spirit-filled notion. It is simply asserted that it cannot be baptism because that would mean an anachronistic notion (baptism) was in the text. But of course John the Baptist was around before Jesus, and he baptized with water… and the spirit. Now, I am Lutheran, so my perspective on baptism certainly differs from that of Allison’s, but his treatment of this passage seemed exegetically impossible. Gregg Allison’s interaction with Roman Catholicism is enormously helpful in that it walks readers through the beliefs of Roman Catholics from their own Catechism. The strength of the work is its broadness, which is also its weakness as individual topics are sometimes skimmed over too briefly. That said, Roman Catholic Theology and Practice: An Evangelical Assessment is a simply fantastic book for those looking to learn more about Roman Catholicism and the issues that divide it from evangelical theology. Allison has done a service to the church with this book that provides both a reference and a critical perspective when dealing with Roman Catholic theology. Gregg Allison, Roman Catholic Theology and Practice: An Evangelical Assessment (Downers Grove, IL: Crossway, 2014). Does the author also critic the source material for the Catechism? Such as the Early Apostolic fathers of the Church? Moreover to be fair to the Catechism (which is not Theological treaty) does he also take into account the Augustinian and Thomistic writing that have greatly influence not only Catholic theology but also the theology of the reformers especially St. Agustine? Sorry I apparently missed your comment when it was made. It does not go into the background of the catechism. It is specifically a review of and interaction with the catechism. A few background issues are hinted at, but that is all. It is intended to be an overview of primary Roman Catholic doctrines with interaction from an evangelical viewpoint. At that, it succeeds. If you’re looking for a more technical analysis, this is not it (and again, that is not its intent).